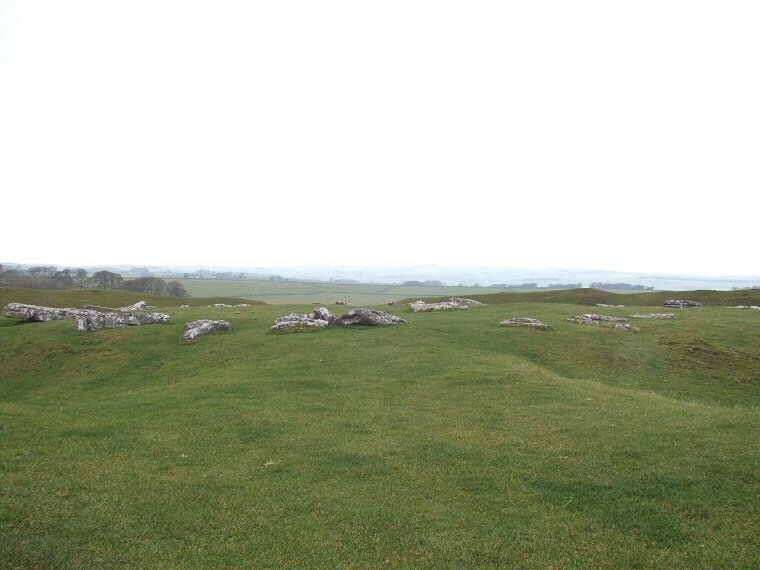 Arbor Low henge and circle. View looking northwest from the southeastern bank. 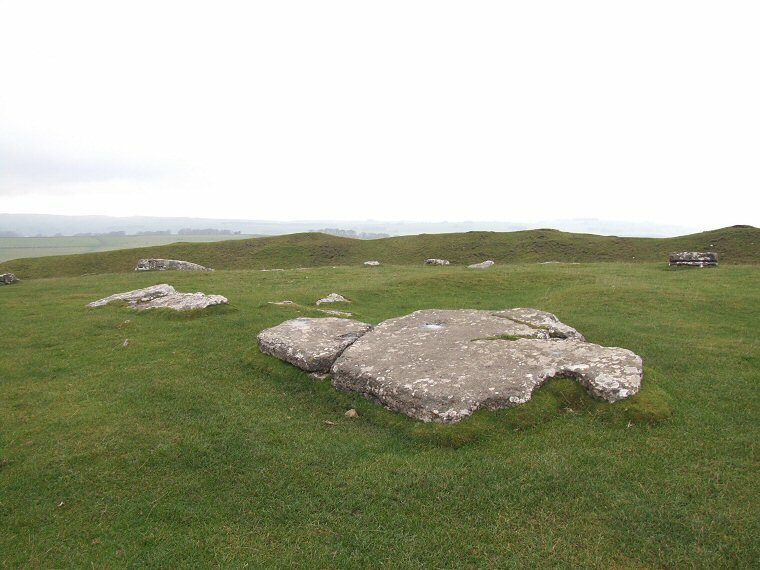 High up in the Derbyshire Peak District on Middleton Moor 'the Stonehenge of the North', Arbor Low is the most important monument in this area. 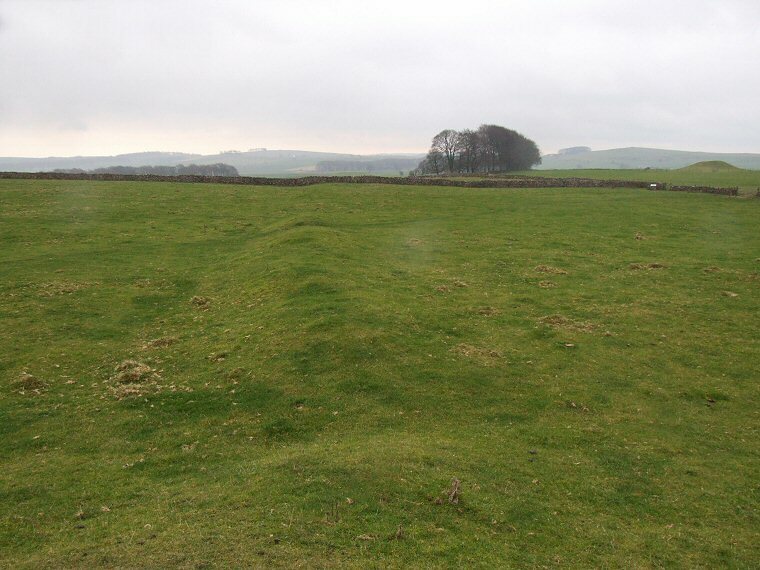 The area itself is rich in prehistoric remains, there are many round barrows in the surrounding fields as well as a later Roman road that runs northwest to southeast about 500 metres to the west. 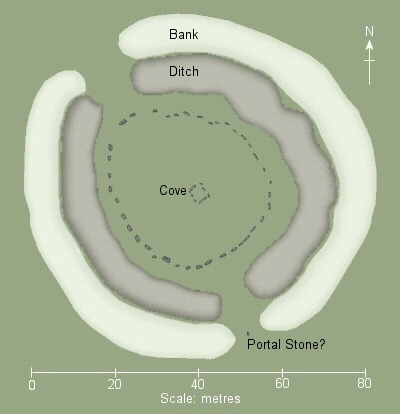 The henge is huge with the bank having an outer diameter of between 85 and 90 metres and originally standing to a height of about 3 metres and being 8 to 10 metres wide, there is a later round barrow partly built on the southeastern side of the bank. 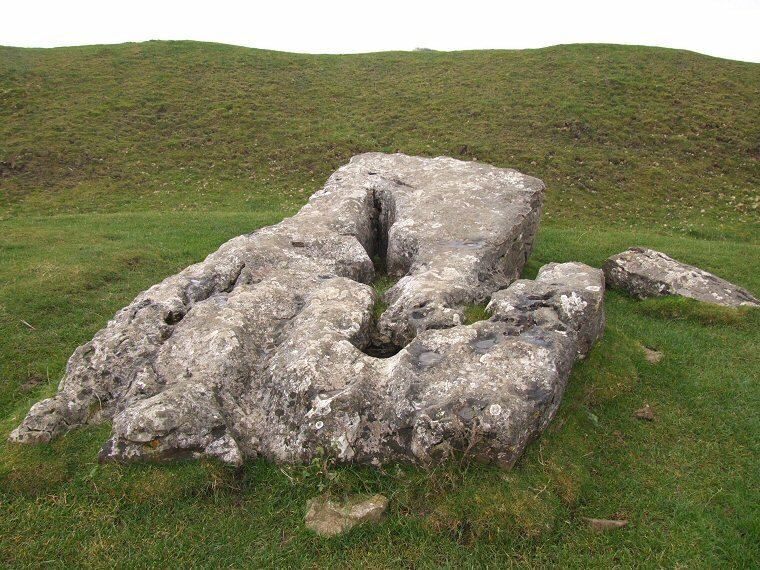 Cutting through the bank were wide entrances to the northwest and southeast which makes this a Class II henge and there is evidence that these entrances could once have been flanked by portal stones - a stump and fallen stone still remain just outside the southeast entrance. 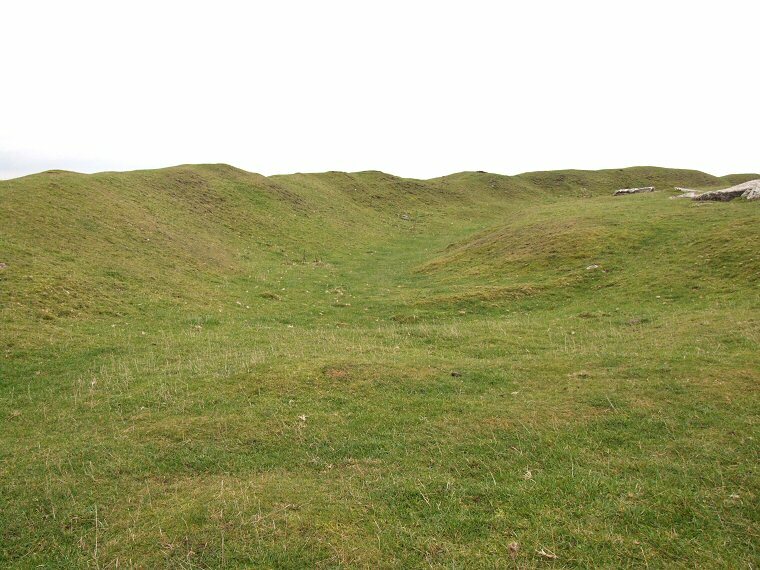 Within the outer bank is a 2 metre deep steep sided ditch which varies from 7 to 12 metres in width and which would have required the removal of an estimated 4000 tons of limestone, here the entrances continue as causeways over the ditch. 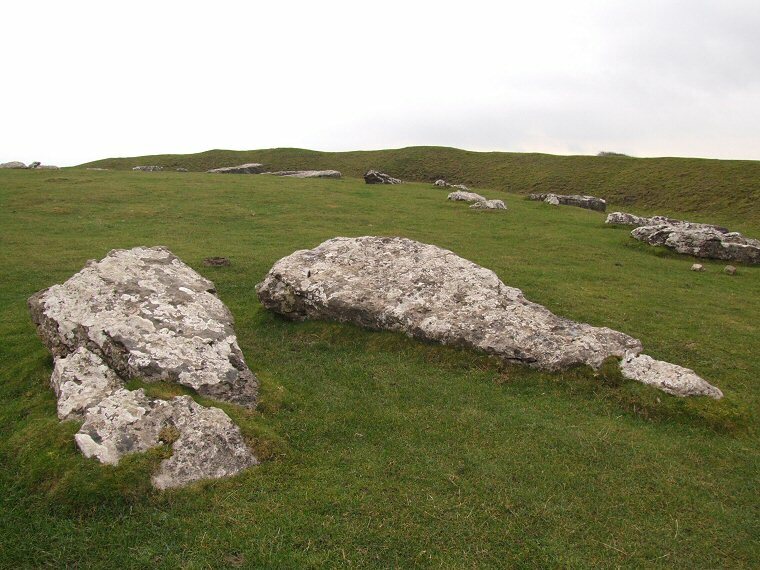 The central plateau measures roughly 50 metres along a northwest to southeast axis and about 40 metres wide and contains a rough oval or egg shaped arrangement of 50 fallen and broken heavily eroded limestone blocks. It is thought that there were originally about 40 stones, the breakage of some of the blocks leading to the increased number seen today. The tallest stones which were close to the entrances would have stood 3 metres tall with the heights of others decreasing to about 1 metre. 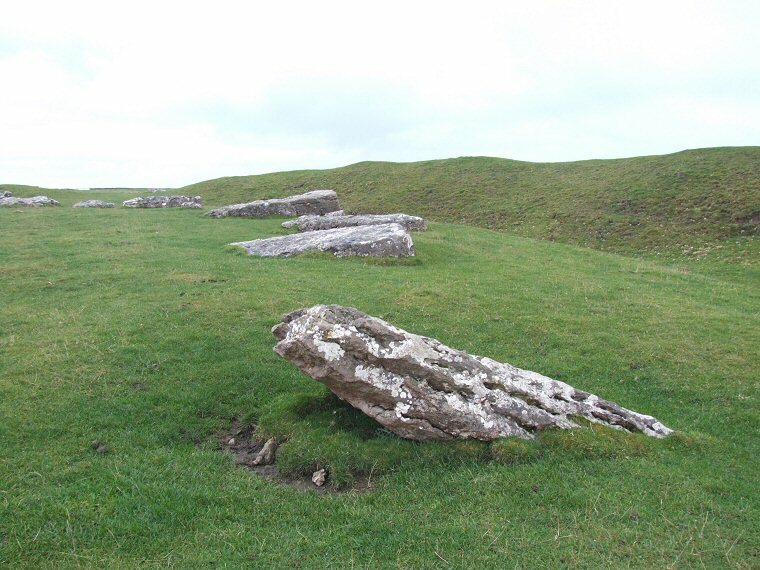 Although some people have claimed the stones never stood upright, it seems more probable that they simply fell due to being placed in sockets that were too shallow - the possibility that any remaining uprights were pushed over or smashed in historic times by over zealous Christians or superstitious locals also cannot be ruled out. 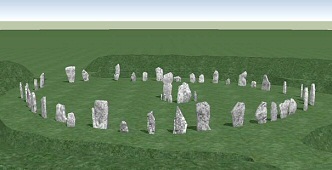 At the centre of the circle was a rectangular or horseshoe setting of stones. 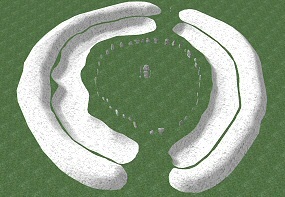 This 'cove' consisted of at least six stones and those that believe it to have formed a horseshoe shape suggest that the open end would have faced a midsummer moon setting to the south-southwest. 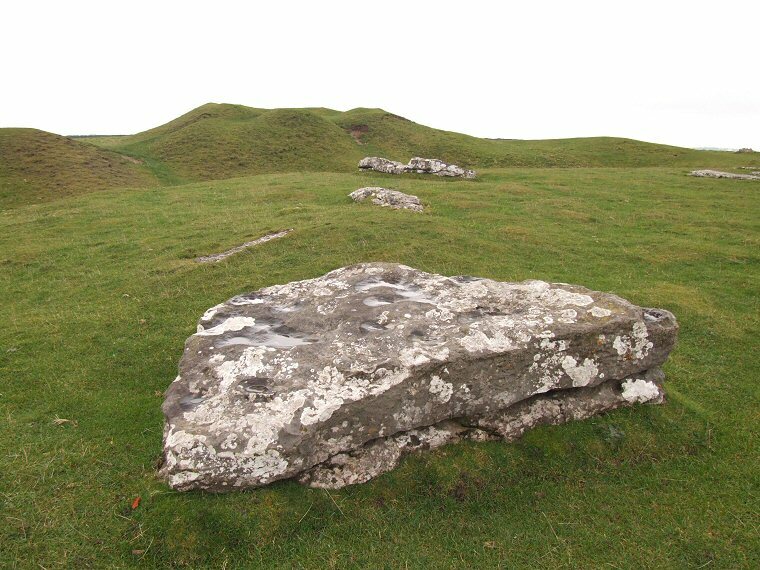 Coves are very rare at British prehistoric sites with only three other examples in England - at Stanton Drew, Avebury and Castlerigg. 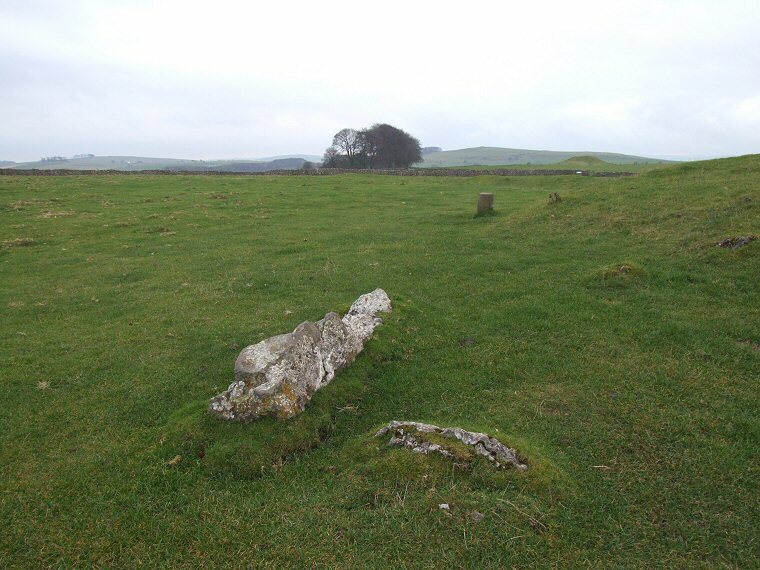 There have been many finds from Arbor Low which has been subject to several excavations over the last 150 years and possibly earlier, these include cremation remains as well as many flint, bone and antler tools and pots. Adjoining the southern edge of the henge bank is a much lower earth bank and filled ditch which have been interpreted as an avenue that extends south-southwest for about 300 metres before curving round to the west to pass to the south of Gib Hill, a Bronze Age round barrow built on top of an earlier Neolithic oval barrow. 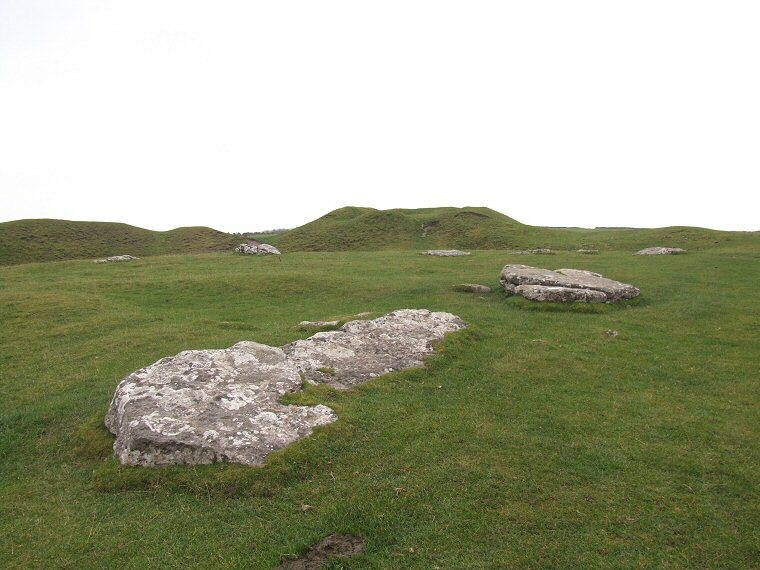 View northeast across Arbor Low, the bank is clearly visible behind the stones. Wide angle shot through the northwest entrance of the henge earthwork. 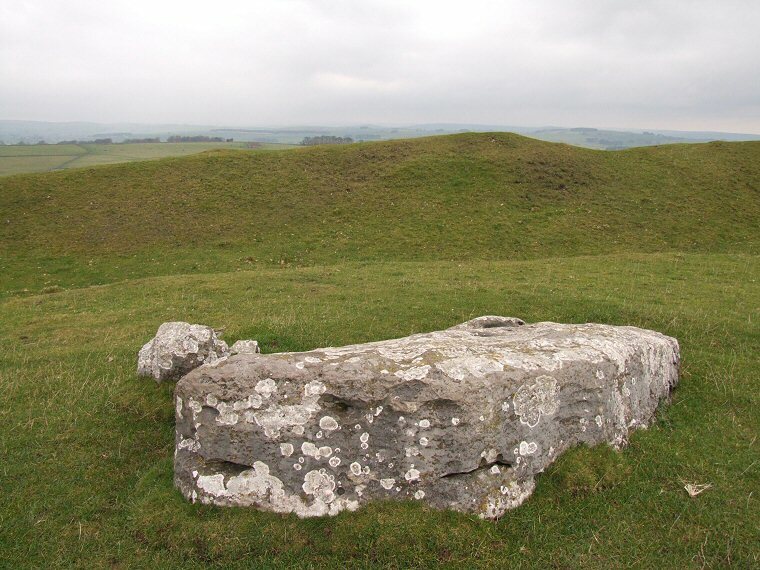 Reconstruction of Arbor Low - simple 360 degree rotating animation. 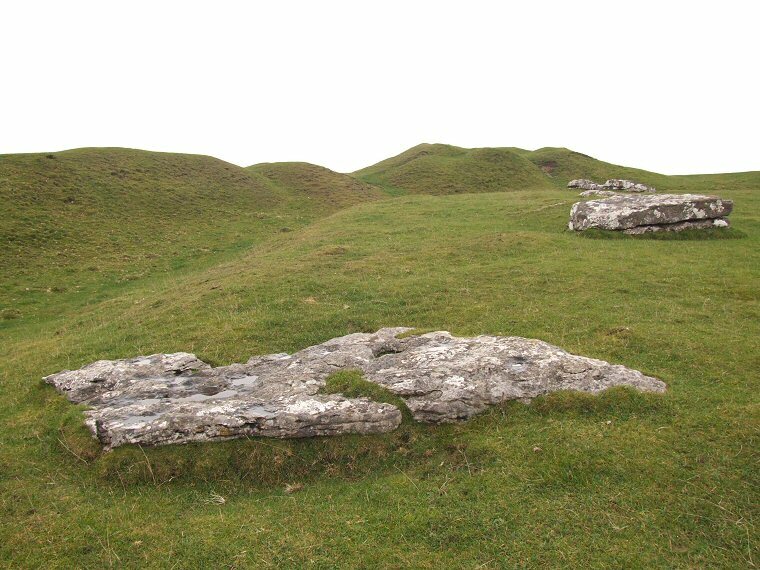 Reconstruction of Arbor Low - flythrough animation showing freshly cut bank and ditch.